Disha India is working with Experience based Learning Systems, USA, on how we can use experiential learning theory for designing the curriculum, pedagogy and practices in K-12 education. 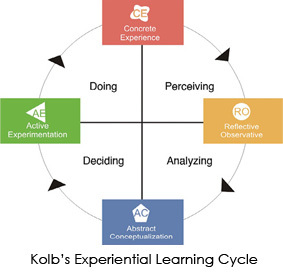 Prof Kolb, the founder and chairman of EBLS, has developed a theory of learning from experience. Based on the above theory of experiential learning, Dr Kolb has designed the Learning Style Inventory. The LSI helps people to understand their learning cycle, their preferred learning mode and the learning flexibility. Disha India is working on how we can use LSI to develop the learning capacity i.e. learning how to learn among teachers and children in schools. The idea behind this is to design a curriculum and pedagogy which helps children in understanding and developing their learning how to learn capacity and empowers them to become self-learners for life. Educator Role Profile, an inventory designed by Dr Kolb, helps in understanding the different roles that an educator need to perform in facilitating the experiential learning. The four different roles that an educator needs to perform are –facilitator, subject expert, evaluator and that of a coach. Disha India is doing a research with EBLS to find the connection between the LSI and ERP i.e. how personal learning style affects teaching style and vice-versa. We are also in the process of adapting the ERP for K-12 education and designing a development framework for K-12 educators.